Eight actors started the theatre in 1972 when they tranformed a laundromat into a theatre. Realizing they needed someone to guide and direct them, they approached theatre and film legend Lonny Chapman, who provided an artistic mission, vision and focus for their work. One hundred seventy-five plus productions later, the Group's home is now located at 10900 Burbank Blvd. in North Hollywood. 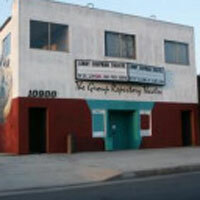 The LCGRT is one of the largest and most inviting Equity 99-seat houses in the city of Los Angeles.